“Rise Against Hunger” sponsored by Pathway Sunday School Class Saturday, April 6th 10 AM-12 Noon – First Baptist Church – Church Hill, Tn. "Where LOVE is practiced as well as preached"
Pathways Sunday School Class is hosting a Rise Against Hunger Meal Packing Event on Saturday, April 6th from 10:00 AM – 12:00 Noon in the Activities Building. 10,152 meals (6 meals per bag) for a total of 1,700 bags to packaged. $3,451.68 needed to fund the event. Volunteers needed to package the meals. We would like to have at least 50-80 volunteers. All tools and food items for prepping meals are provided. Pathways Sunday School Class will be having a church-wide bucket offering on two Sundays to raise money to fund the event. The first bucket offering is scheduled for Sunday, January 27th. Below is the link to sign up to VOLUNTEER and DONATE. Here is where we are…..Click below for directions. 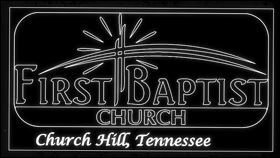 Copyright © 2019 First Baptist Church – Church Hill, Tn.